TORONTO, ON--(Marketwired - December 07, 2016) - Global car sales posted a further solid advance in October, climbing 5% above a year earlier. Asia continued to lead the way, with gains buoyed by a 23% surge in China. More recent data for North America indicate that new vehicle sales revved up to monthly highs for November in all three NAFTA countries. Volumes in both Canada and Mexico posted double-digit year-over-year advances, while U.S. purchases exceeded expectations. Subprime auto delinquencies are on the rise in the United States, but represent a small share of household debt, pointing to limited risk. Nevertheless, weaker-than-expected Q3 earnings at a major automaker combined with reports of increased vehicle repossessions and subprime auto loan delinquencies have led to unease about the prospects for U.S. auto sales next year. "We believe these developments are a reflection of the increase in number of vehicles being financed, and not a sign of weakening demand," said Carlos Gomes, Senior Economist and Auto Industry Specialist at Scotiabank. "We maintain our view that replacement of an aging fleet combined with rising incomes and improving household balance sheets are likely to lift U.S. new vehicle sales to new heights in 2016 and 2017." The overall U.S. auto loan portfolio remains stable. U.S. purchases of new and used vehicles have climbed 2% so far this year and are on target to surpass the 2015 annual total of 57 million units -- one of the highest levels of the past decade. However, even with this year's gain, overall vehicle sales in the U.S. still remain below the roughly 60 million units that were normal each year between 2001 and 2006. Data from Experian, a leading global information services company, indicate that more than 86% of all new vehicles in the United States are currently financed, as well as 56% of all used vehicles. Given the growth in automotive lending, it should not be a surprise that the number of repossessed vehicles and delinquencies are on the rise. However, the key metric that analysts and commentators should focus on to gauge the health of the industry is not the absolute level of repossessions or delinquencies, but the trend of the overall loan portfolio. Even with the large increase in automotive lending in recent years, auto loans still account for only 9% of U.S. household debt, compared with the 74% share garnered by mortgages prior to the collapse of the U.S. housing market. In addition, subprime auto loans represent only 2.5% of overall household debt and lenders have been scaling back these loans over the past year. 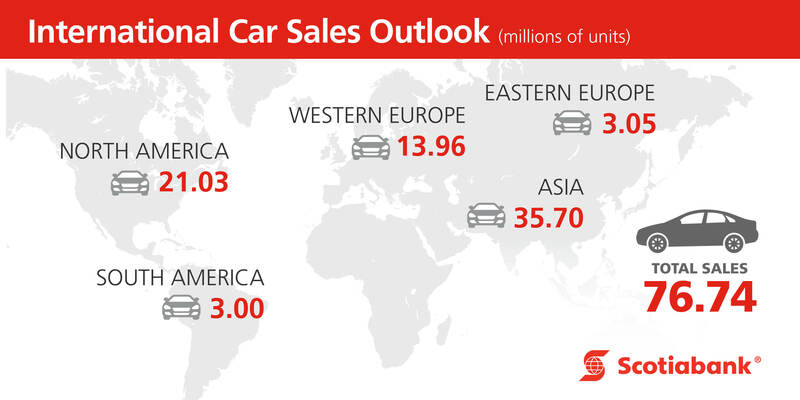 Global car sales posted a further solid advance in October, climbing 5% above a year earlier.